To frame it, I'm going to stretch it across an 8x8 painting canvas. First, obviously, it needs to be blocked. This one is substantially harder, so it is going to take longer. If you haven't checked out the Satusma Street Etsy store (linked above) and you like to embroider, you might want to see all her designs. I thought I was done with cross stitch until I saw these adorable designs! It's been more than a week since I blogged, though I have tried to read many of your posts. I've hit another bump on the health road and am doing a treatment that makes me super tired. I've been reaching for my easiest projects as a result, and lately that means my Winter Rose socks. They are practically knitting themselves. I've only done one sketch this month: this drawing of our Hoosier Cabinet. Keith bought it long before he met me, but I really like it. These have been lazy winter days. My priority is getting through work. Then I come home and collapse in the window seat. Kind of like a cat. I can't sign off without saying something about the latest school shooting. I am so heartened by the efforts coming from the Florida teens. Maybe they can do what adults have been unable to do -- sensible gun laws! I will never understand why anyone thinks their right to own a weapon outweighs a child's right to be alive. If you haven't listened to Emma Gonzalez's speech, you must! You can find it here. She gives me hope for the future! I did get my snow day Friday, so that was the start of an awesome weekend! It gave me time to start on a project I am in love with: Winter Rose socks. It is the first pattern in the Helen Stewart's Secret Sock Society. And isn't that yarn gorgeous? I won it in one of Andi's giveaways. The dyer is Great Lakes Tweed, and I know this isn't the last skein of this yarn I'll have on my needles. It is a joy to work with. I went for a joyous walk Friday afternoon. I don't mind the cold at all when there is fresh white snow and a cerulean blue sky. And I've begun doing 20 minutes of yoga every couple of days, thanks to this DVD, which I've owned for years before finally putting it to use. I'm slowly making my way through Liz Steel's Watercolour Class, and it is both fun and transformative. 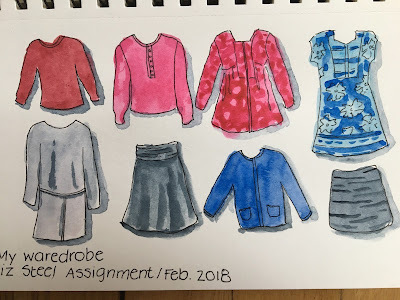 One of my favorite exercises so far was painting my wardrobe. And later today I'll be doing the only form of exercise I truly love: cross country skiing! I hope you are having a fabulous weekend, too. It is supposed to start snowing any moment, and I'm hoping for more than the 3 to 5 inches that have been predicted. Maybe we'll have a snow day tomorrow! I'm pretty sure every teacher in southern Wisconsin has his or her fingers crossed right now. I'd love to stay home and read. Right now I am loving both the books on my bedside table. The Essex Serpent by Sarah Perry is written in modern English but has the feel of a Victorian novel and is set in 1890s England. There are rumors of a serpent, as well as a widow with a socially conscious friend, her autistic son, and a bevy of other intriguing characters. I've been waiting for Janesville: An American Story by Amy Goldstein to come out in paperback. The book tells the story of what happened in the city of Janesville, Wis., after GM closed a huge plan there. I grew up in Beloit, just 15 minutes from this plant. Beloit was always Janesville's poor sister city because we never had a plant like the GM monster in Janesville. Back in the '70s, tons of my schoolmates were happy to head for those great union jobs rather than college. Of course, I want to know the rest of the story. As for listening, I am still making my way through Prairie Fires, about the life and times of Laura Ingalls Wilder and her daughter, Rose Lane. The real story is so much darker and more complex than the rosy world set out in the Little House books. I'm listening to this on Audible, and it's perfect for knitting. I decided to make this hat after a sock I made from this yarn just didn't feel right. The yarn is Cascade Heritage Prints, and the sock was stiff and kind of small. I also wasn't happy with the striping. But, I love the way this hat is looking. Best of all, this is a stash-buster. That sock has been sitting in my basket for a couple of years. It's been an extra-quiet weekend here. A few inches of snow plus sub-zero temperatures have made it a lovely weekend to hunker down. Few things are cozier than knitting on such a weekend. As part of my stash-busting efforts, I've been working on a second Tchaikovsky Hat. The yarn is a merino-silk blend so the hat will be super soft and comfortable. This skein languished in my stash for at least a decade. The hat design is from my current knitting crush -- Helen Stewart of Curious Handmade -- and I'm excited to say that I finished my Vintage Fairy Lights socks on time! A number of you have asked what this yummy yarn is. The dyer is Casual Fashion Queen and the colorway is Bohemia. I'm awaiting tomorrow's release of the first pattern in the Secret Sock Society, a Curious Handmade project. 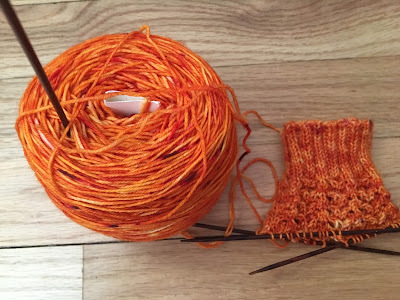 Helen will be releasing a new sock pattern every two months. As she points out, this means knitting just one sock a month. I should be able to keep up with that! Today is the last chance to join at the early bird price. You can join up at this link. Yesterday, before the snow and plunging temperatures, I did get to Barnes & Noble to pick up a gift and do a quick sketch. Not my best, but then, the whole point is to practice. I'm sure I'll get more knitting done tonight while Keith watches the Super Bowl. I will never understand why anyone likes to watch sports! I'll be snuggled up in my craft room, listening to an audiobook and sipping on yet another cup of tea.